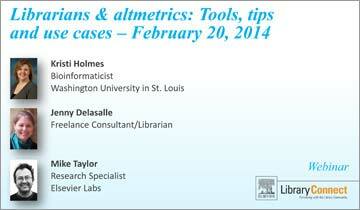 More than 1,900 people have viewed the February 20 Library Connect webinar Librarians and altmetrics: Tools, tips and use cases. The live audience of 1,239 comprised librarians and information specialists from 70+ countries, while hundreds of others have viewed the recorded event. The three speakers presented various aspects of altmetrics, beginning with Mike Taylor (@herrison), a research specialist with Elsevier Labs. He explained that altmetrics are not homogenous; they are usage indicators with different sources and activities, such as shares or recommendations from social networks such as Twitter or Mendeley. He also elaborated on how librarians can create a homegrown altmetric system or work with various providers, and he addressed some of the key criticisms around altmetrics. Jenny Delasalle, a freelance consultant and librarian, described the potential of altmetrics. Altmetrics are appearing in library subscription products, open access journals, and institutional repositories. She explored questions of whether the viewing of altmetrics should be restricted and types of article-level metrics, as well as their potential for crowdsourcing. The final speaker, Kristi Holmes, a bioinformaticist with Washington University in St. Louis described the Becker Model, which supplements publication analysis to enhance and demonstrate meaningful research impact. She explored uses for metrics beyond promotion and tenure, such as identifying collaborators or quantifying ROI. And she showed examples of how scholarly profiles have been enhanced with altmetrics.